Prior to June 2018, the use of the name Macedonia was disputed between Greece and the then-Republic of Macedonia. The Prespa agreement, signed by Macedonia and Greece on 17 June, saw the country change its name to the Republic of North Macedonia eight months later. A non-binding national referendum on the matter passed with 90% approval but did not reach the required 50% turnout due to a boycott, leaving the final decision with parliament to ratify the result. Parliament approved of the name change on 19 October, reaching the required two-thirds majority needed to enact constitutional changes. The vote to amend the constitution and change the name of the country passed on 11 January 2019 in favour of the amendment. The amendment entered into force on 12 February, following the ratification of the Prespa agreement and the Protocol on the Accession of North Macedonia to NATO by the Greek Parliament. Previously, on 25 January, the Greek parliament had narrowly voted to back the agreement, with 153 approving and 146 against. As of 31 May 2017, the Prime Minister of North Macedonia is Zoran Zaev, who also heads the SDUM, and the current President of the Parliament is Talat Xhaferi. The election of Xhaferi was immediately met with protests led by VMRO-DPMNE, which was quickly handled by the police. The current government introduced a flat tax system with the intention of making the country more attractive to foreign investment. The flat tax rate was 12% in 2007 and was further lowered to 10% in 2008. Despite these reforms, as of 2005 North Macedonia's unemployment rate was 37.2% and as of 2006 its poverty rate was 22%. Due to a number of employment measures as well as the successful process of attracting multinational corporations, and according to the State Statistical Office of North Macedonia, the country's unemployment rate in the first quarter of 2015 decreased to 27.3%. Government's policies and efforts in regards to foreign direct investments have resulted with the establishment of local subsidiaries of several world leading manufacturing companies, especially from the automotive industry, such as: Johnson Controls Inc., Van Hool NV, Johnson Matthey plc, Lear Corp., Visteon Corp., Kostal GmbH, Gentherm Inc., Dräxlmaier Group, Kromberg & Schubert, Marquardt GmbH, Amphenol Corp., Tekno Hose SpA, KEMET Corp., Key Safety Systems Inc., ODW-Elektrik GmbH, etc. In terms of GDP structure, as of 2013 the manufacturing sector, including mining and construction constituted the largest part of GDP at 21.4%, up from 21.1% in 2012. The trade, transportation and accommodation sector represents 18.2% of GDP in 2013, up from 16.7% in 2012, while agriculture represents 9.6%, up from 9.1% in the previous year. The Assembly of the Republic of North Macedonia (Macedonian: Собрание на Република Северна Македонија, Albanian: Kuvendi i Republikës së Maqedonisë së Veriut) or the Sobranie (Macedonian: Собрание, "Assembly"), is the unicameral representative body of the citizens of North Macedonia; it is North Macedonia's sole legislature. According to the Constitution, the Sobranie represents the people and is vested with legislative power. It can have between 120 and 140 MPs (currently 120), elected by proportional representation from 6 electoral districts, each contributing 20 MPs, and there are also 3 reserved seats elected from the Macedonian diaspora which are awarded only if the voter turnout was sufficient. MPs are elected for a term of four years and cannot be recalled during their term. The Sobranie is presided over by a Speaker. Its organization and functioning are regulated by the Constitution and Rules of Procedure. The Assembly's seat is in the nation's capital, Skopje. The flag of North Macedonia (Macedonian: Знаме на Северна Македонија) depicts a stylized yellow sun on a red field, with eight broadening rays extending from the center to the edge of the field. It was created by Miroslav Grčev and was adopted on 5 October 1995. The first flag of the country featured the Vergina Sun which had been discovered at Aigai, the first capital and burial ground of the ancient kings of Macedon. Greece considers the Vergina Sun to be a Greek symbol and imposed a year-long economic embargo in order to force the then Republic of Macedonia to remove it from its flag, resulting in the current design. The new eight-rayed sun represents the "new sun of Liberty" referred to in Denes nad Makedonija, the national anthem of North Macedonia. The change of the flag was at first not accepted by conservative Macedonians, nationalists, and Greek patriots. In the first years after the change, both flags were officially flown for a long time. Between 1995 and 1998, in the municipalities where then-opposition party VMRO-DPMNE ruled, only the old flag was flown from institution buildings. Popular opinion was divided about the merits of changing the flag; a survey carried out before the Assembly's vote found that a majority of the population, 56.33 percent, supported the adoption of a new flag. The Assembly voted for the new flag by an overwhelming majority of 110 in favor, one against, and four abstaining. The Football Federation of Macedonia (Macedonian: Фудбалска Федерација на Македонија / Fudbalska Federacija na Makedonija or ФФМ/FFM) is the governing body of football in North Macedonia based in Skopje. It was founded in 1926. This article is about the history of the territory covered by the modern North Macedonia. A list of feature films produced or filmed on the territory of the current North Macedonia. 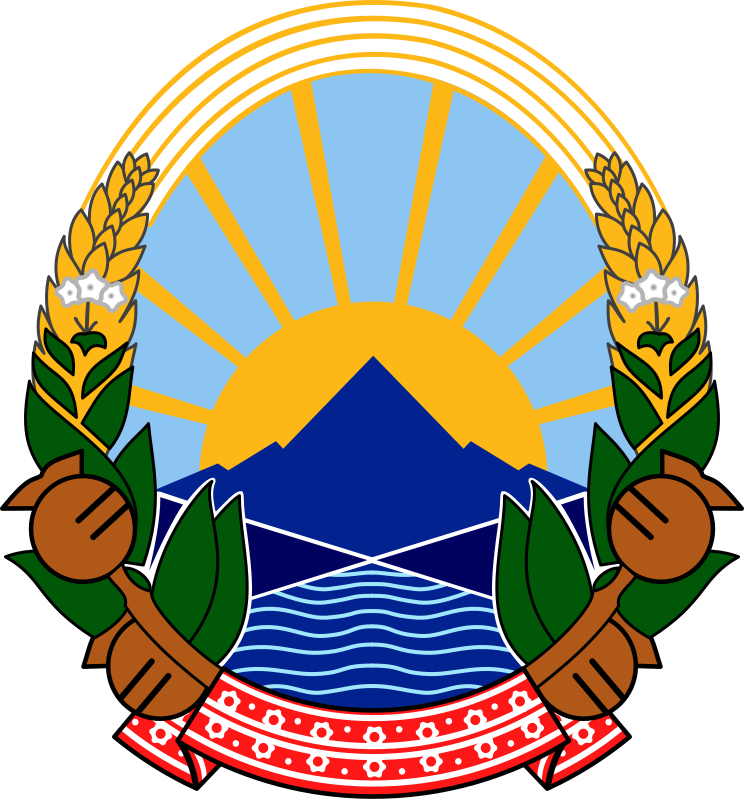 The municipalities are the first-order administrative divisions of North Macedonia. In February 2013, North Macedonia was reorganised into 80 municipalities (Macedonian: општини, opštini; singular: општина, opština); 10 of the municipalities constitute the City of Skopje (or Greater Skopje), a distinct unit of local self-government and the country's capital. one of these regions, Skopje, encompasses Greater Skopje and the surrounding area. The music of North Macedonia refers to all forms of music associated with the Republic of North Macedonia. It has much in common with the music of neighbouring Balkan countries, yet maintains a distinctive sound. North Macedonia, formerly presented in the contest as the Former Yugoslav Republic of Macedonia (F.Y.R. Macedonia), has participated in the Eurovision Song Contest 18 times since its official debut in 1998. The country had attempted to participate in 1996, but failed to qualify from the audio-only qualifying round. North Macedonia is one of the most unsuccessful countries in the contest, having failed to crack the Top 10 in the 8 appearances it has made it to the final. North Macedonia's best result in the contest is Elena Risteska's 12th-place finish in 2006. North Macedonia has failed to qualify from the semi-final round in ten of the last eleven contests (2008–18), the exception being Kaliopi, who finished 13th in the 2012 final. The current Head of Delegation is Meri Popova. The North Macedonia national football team (Macedonian: Фудбалска репрезентација на Македонија, Fudbalska reprezentacija na Makedonija, formerly known officially as the Macedonia national football team) is the national football team of North Macedonia and is controlled by the Football Federation of Macedonia. The team plays its home games at the Toshe Proeski Arena in Skopje. Despite being one of the less successful national teams from former Yugoslavia, North Macedonia has still produced several good results, notably drawing with England twice away, drawing Italy and Netherlands once (both away), as well as beating Croatia 2–0 in 2007 and Serbia at home 1–0 in 2012. Some popular Macedonian footballers have also played for different national teams, notably Marek Jankulovski who represented Czech Republic. On 12 August 2009, as part of the 100-year anniversary of football in the country, the national team played a friendly match against Spain. Star player Goran Pandev scored two goals in the first half to give Macedonia a 2–0 lead before Spain scored three goals in the second half to record the 3–2 victory in front of a record crowd of 30,000 at the renovated Toshe Proeski Arena. The Macedonian national under-21 football team, formerly known as Macedonia under-21(s) and Macedonia U21(s), is a youth association football national team which represents North Macedonia at this age level and is a feeder team for the Macedonia national football team. This team is for Macedonian players aged 21 or under at the start of a two-year European Under-21 Football Championship campaign, so players can be, and often are, up to 23 years old. Also in existence are teams for Under-20s (for non-UEFA tournaments), Under-19s and Under 17s. As long as they are eligible, players can play at any level, making it possible to play for the U21s, senior side and again for the U21s. It is also possible to play for one country at youth level and another at senior level (providing the player is eligible). The under-21 age category came into existence with the realignment of UEFA's youth competitions in 1976. The Macedonia U21 team was formed following Macedonia's independence from SFR Yugoslavia in 1991 and is controlled by the Football Federation of Macedonia (from 1976 to 1992 Macedonian players played for Yugoslavia U21). A 7–0 win in a friendly against Estonia played on 31 May 1994 was Macedonia U21s' first result. Four months later, Macedonia also had their first competitive match which ended in a 5-3 win against Denmark. So far, Macedonia has qualified for one final tournament, the one being the 2017 Euro U21 held in Poland for players born 1994 or later. Macedonia ended the tournament on the 11th position with 1 draw and 2 losses over the group stage. The President of the Republic of North Macedonia (Macedonian: Претседател на Република Северна Македонија; Albanian: Presidenti i Republikës së Maqedonisë së Veriut) is the head of state of North Macedonia. The institution of the Presidency of the modern North Macedonia state began after the Macedonian declaration of independence on 8 September 1991. Its first president was Kiro Gligorov, the oldest president in the world until his resignation in 1999. The North Macedonia presidency is largely a ceremonial post and the Prime Minister of North Macedonia is the country's leading political figure and de facto chief executive. The president must be a citizen of North Macedonia, be over 40 years of age and have lived in North Macedonia for at least ten of the previous fifteen years. The Prime Minister of North Macedonia, officially the President of the Government of the Republic of North Macedonia (Macedonian: Претседател на Владата на Република Северна Македонија; Albanian: Kryeministri i Republikës së Maqedonisë së Veriut), is the head of government of North Macedonia. He or she is the leader of a political coalition in the North Macedonian parliament (the Sobranie) and the leader of the cabinet. The current Prime Minister is Zoran Zaev, who has served since 31 May 2017. In North Macedonia, the most common religion is Orthodox Christianity, practiced by most of the ethnic Macedonians. The vast majority of the Orthodox Christians in the country belong to the Macedonian Orthodox Church, which declared autocephaly from the Serbian Orthodox Church in 1967. Muslims are the second-largest religious group with almost one-third of the population adhering to Islam, mainly from the country's Albanian, Roma and Turkish minorities. There are also many other religious groups in North Macedonia, including the Catholic Church, Protestantism, and Judaism. In 2011, through a survey carried out by Ipsos MORI, the religious composition of North Macedonia was found to be 70.7% Christian, divided in 69.6% Eastern Orthodox and 0.4% Catholics and Protestants, and 28.6% Muslim, with unaffiliated Muslims making up the 25.6%.In 2020, Pew Research Center estimates that due extremely low fertility rates, Christians will fall to 55.1% of the country's population (53.7% Eastern Orthodox, 0.4% Catholic, 0.6% Protestant and other Christian denominations), while 43.6% will be Muslim, 1.3% Atheist, 0.2% Jewish, and 0.2% other. National Arena Toshe Proeski (Macedonian: Национална Арена Тоше Проески), is a sports stadium in Skopje, North Macedonia. It is currently used mostly for football matches, but sometimes also for music concerts or athletics. It is the home stadium of FK Vardar and FK Rabotnički from Skopje, both of which compete in the Macedonian First League, as well as the home ground of the North Macedonia national football team on almost all occasions (the other venues rarely chosen being the Goce Delčev Stadium in Prilep, or SRC Biljanini Izvori in Ohrid). On 30 June 2015 the UEFA announced that the National Arena Toše Proeski will host in 2017 for the first time an UEFA Super Cup final. The stadium was previously known as the City Stadium Skopje (Macedonian: Градски Стадион Скопје) until 2009 and Philip II Arena (Macedonian: Национална Арена Филип Втори) until 2019, when was renamed in a honour of the Macedonian pop icon Toshe Proeski. North Macedonia's vehicle registration plates consist of a two-letter region code, followed by a 4-digit numeric (before 2012 was 3 digits) and a 2-letter alpha code (e.g. SK 2345 MG). There is a blue field on the left side with the international country code for Macedonia - NMK (formerly MK). License numeric code contains combination of four digits (0-9), while two letter alpha code is made of combination of letters using English alphabetical order. The standard registration plates of vehicle, dimensions are 520 millimetres (20 in) × 110 millimetres (4.3 in). Issuance of the former Macedonian plates began February 20, 2012. From 1993 to February 20, 2012, the ten existing codes were: BT, GV, KU, OH, PP, SK, SR, ŠT, TE, and VE. On February 20, 2012, in addition to the ten existing codes, seven new codes were introduced: GE, KA, KI, KO, KP, RA, and SU. On March 1, 2013, in addition to the seventeen existing codes, six new codes were introduced: BE, DE, NE, RE, SN, and VI. On September 1, 2013, in addition to the twenty-three existing codes, one new code was introduced: VV. On July 4, 2015, in addition to the twenty-four existing codes, seven new codes were introduced: DB, DK, MB, MK, KR, PS, and VA. Visitors to the Republic of North Macedonia must obtain a visa from one of the Republic of North Macedonia diplomatic missions unless they come from one of the visa exempt countries. Visa policy of the Republic of North Macedonia is similar to the visa policy of the Schengen Area. It grants 90-day visa-free entry to all Schengen Annex II nationalities except Dominica, Georgia (without a voucher), Grenada, Kiribati, Marshall Islands, Micronesia, Palau, Samoa, Saint Lucia, Saint Vincent and the Grenadines, Solomon Islands, Timor-Leste, Tonga, Trinidad and Tobago, Tuvalu and Vanuatu. It also grants visa free access to several additional countries – Azerbaijan, Botswana, Cuba, Kazakhstan, Kosovo, Russia and Turkey.Visitors must hold passports that are valid for at least 3 months from the date of arrival.